A temporary car park and baggage reclaim area are expected to be set up at Timaru's airport to cater for an influx of visitors flying into Timaru. The first of Air New Zealand's 50-seat Q300 flights arrived at the Richard Pearse Airport on Monday, bumping up the number of people making their way through the airport. The new flights also brought in more cars to the airport car park, with readers telling Fairfax that some visitors were forced to park on grass near the car park because of a lack of space. A $1.3 million airport redevelopment project is due to begin after July 1, but the Timaru District Council has plans ready to put in place to cope with the additional visitors in the interim. District services manager Ashley Harper said parking had already been identified as an issue, and a temporary car park would likely be set up once the council determined how much extra space was needed. The extra parking area would be set up on a grassy area near the terminal, and would be fenced off, he said. It was expected to be put in place in about two weeks. If the amount of luggage coming through the terminal became a problem, an outdoor baggage reclaim facility would be also be set up, he said. The terminal itself was big enough to cater to up to 50 people, and would not require any changes prior to the upgrade, Harper said. Finalised plans for the terminal building were expected to be signed off this week, after consultation with Air New Zealand about its requirements, he said. It was hoped the project would be put out for tender by May 31. Harper expected the car park to be completed by the end of October, and the entire project to be wrapped up by the end of the year. The upgrade will include the provision of 40 new car parks to help provide for a 50 per cent a week jump in in potential passenger numbers. The completion of the car park will also signal the beginning of parking fees at the airport. Users will be able to park for up to two hours for free, with a charge of $5 per day coming into effect after that. The drop-off and pick-up area near the terminal will also be redeveloped and a barrier arm will be installed at the redeveloped carpark. Harper was confident the barrier-arm controlled, 103-park area would generate at least $86,000 a year. While passenger numbers had been expected to slowly build towards the 50 mark, there had been at least 40 people on each flight so far, he said. "It's been really good." The budget for the airport redevelopment was initially set at $875,000, but discussions with Air New Zealand about its requirements meant councillors later approved an increase to $1.3 million. That consisted of $725,000 for the airport terminal upgrade and $575,000 to improve the airport's carpark. Barrier Air has had a busy day today on flights to Great Barrier Island... Today it operated 30 return flights between Auckland and Great Barrier today, 13 return between North Shore and Great Barrier, as well as a return service from Kaitaia to Auckland. They have also been using Piper PA31 Navajo ZK-MJF since yesterday afternoon. I stole the picture below from the Flinders Aviation Facebook page, https://www.facebook.com/flindersaviation/?fref=nf. The caption reads... Final lay out. Orange tail this afternoon and then back together. Sunair's Cessna 172 ZK-DPN was being used by the Tauranga Aero Club on 16 March 2016. ...and then departing as KRL 9 to Nelson. Kiwi Regional fly the Nelson-Tauranga twice a week with an additional flight to be added later in the year. 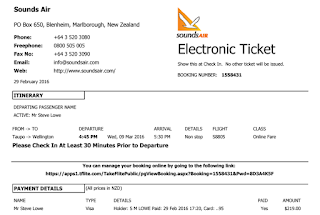 Regional operator Sounds Air expects to carry a total of 100,000 passengers this year as it continues to pick up passengers from old Air New Zealand routes. The Marlborough-based airline been operating for nearly 30 years, flying in and around the Marlborough Sounds, Wellington, Westport, Nelson, Taupo and now Hawke's Bay. Managing director and co-owner Andrew Crawford said when he joined the business in December 2003, Sounds Air had one plane and carried 14,000 passengers annually. The privately-owned airline had gradually added routes and aircraft and had a breakthrough in 2015 when Air New Zealand reorganised its regional services. 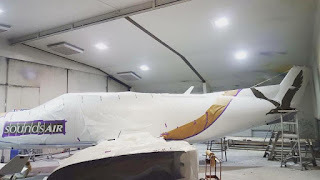 The company added three extra aircraft on routes from Westport and Taupo to Wellington, after local authorities selected the airline as their "preferred supplier". The endorsement boosted its loadings. Air New Zealand had shown no sign of wanting to reinstate its Taupo and Westport flights through Wellington, Crawford said. "They won't come back; they're going to bigger and bigger planes - it just won't happen." Sounds Air had no ambition to challenge Air New Zealand as an operator on main trunk routes, he said. "The fact is, we're a second-tier airline. We know our place in the world." The company employs about 60 staff – including 22 pilots - most of whom are based in Wellington, but also in Blenheim, Picton, Nelson, Paraparaumu, Westport, Napier and Taupo. Sounds Air is owned by Crawford, Cliff Marchant and Stephen Handyside. In 2009 they sold the remaining quarter of the business to four minor shareholders, who have cash in the company, but no hand in running it. Crawford said Sounds Air saw potential in being able to work with Air New Zealand to feed flyers from smaller centres on to international connections, but so far the national carrier had not shown much interest in the concept. An enduring challenge for Sounds Air was changing passenger attitudes to flying in small planes. Crawford said the company's regular customers in Marlborough, Nelson and Wellington knew the company's experience in local conditions, and it had spent time explaining the safety of small planes when it started the Taupo to Wellington route. Three large companies with a policy of not travelling on single engine, single pilot aircraft were persuaded to change that after the airline explained that staff had extensive training in flying in turbulent conditions. "Once people get that factual information, rather than hearsay, they are away and can't believe what they've been missing," Crawford said. A daily challenge for the airline was finding new staff, retaining existing ones, and ensuring everyone was well trained, Crawford said. "We have tried to pay our staff well, they enjoy travel benefits, and recently we have added health care as part of their employment package. It is so much easier to pay people more money than recruit and train new staff. The cost of staff turnover to the business can be huge. " One of the best parts of the business was online bookings, which meant no waiting for payments until the 20th of the month. One of the worst aspects was exposure to a raft of airline industry fees, Crawford said. Allan Prince had strong connections in the freight industry and was managing an overnight inter-city service for Brambles. Allan approached NZ Couriers with whom he had a close association with as he knew they were keen to connect their Auckland, Wellington and Christchurch courier services. Mercury Air Couriers Ltd was formed by Allan, who held a 40% shareholding in association with NZ Couriers who held 51% of the company. The company chartered the Piper Pa23 Aztec ZK-DGT from Akarana Air and this was rebranded with Mercury Air Couriers titles. The association with Akarana Air came about as NZ Couriers and Akarana Air were co tenants in a building in downtown Auckland. Akarana Air in those days was owned and operated by Ivan Reardon and his partner Graham Veitch. Graham originally owned the plane and flew it out of South Africa to escape the political problems and to get his largest asset out of the country. From the 1st of July 1974 the Aztec inaugurated a new five-times-a-week night courier service between Auckland, Wellington and Christchurch. The Aztec left Auckland at 7.00pm arriving at Wellington at 8.50pm. It left for Christchurch at 9.30pm arriving at 10.45pm. The return service departed at 11.25pm arriving back at Wellington at 12.40am the company having a dispensation to take off outside the airport operating hours. After a 40 minute stop the aircraft continued on to Auckland arriving there at 3.10am. Mr Bill Davies, the managing director of the parent company, New Zealand Couriers, told the Auckland Star that the aircraft would carry documents for computer processing, including punchcards, tapes and other documents. Other freight carried was the Turf Digest race paper which was printed at Lower Hutt. It was flown from Wellington to Auckland on Tuesdays. In 1975 an additional weekly Auckland-Wellington service was introduced, and in September 1976 this was increased to five times weekly. Allan Prince went on to sell his shareholding back to the directors of NZ Couriers as they were keen to hold 100% ownership of everything so they could sell the company to an interested buyer. Allan then went on to work with the Freightways Group and set up Courier Systems. He was then heavily involved in the takeover of NZ Couriers/Mercury Air Couriers on behalf of the Freightways Group. A meeting in Taupo on yesterday and one in Wellington today gave me the excuse and opportunity to try out Sounds Air's Pilatus PC-12 on their afternoon flight to the capital, S8 805. Wellington on a beautiful calm day - shooting into the light again! And my thoughts on the PC-12. I was really impressed by how quiet it is and how spacious it is in terms of leg room... I thought a lot better than a Beech 1900 in legroom and quieter than any turbo prop in the Air NZ fleet. As for me... 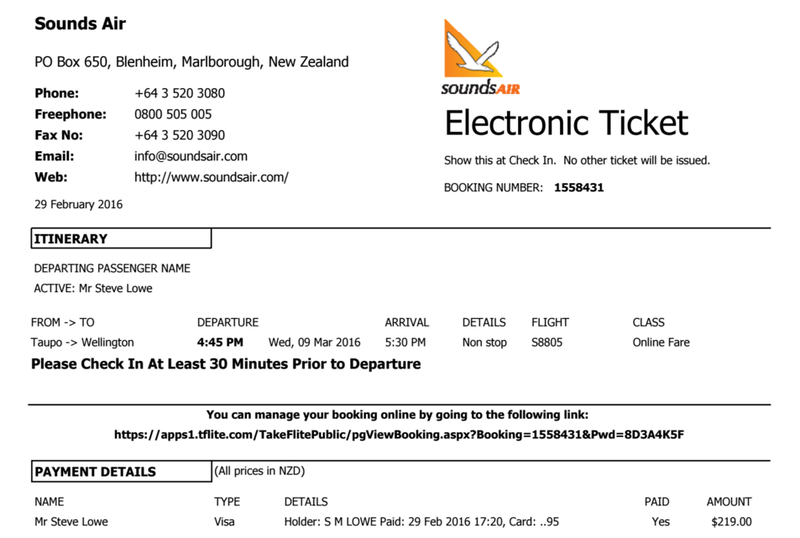 I'm looking forward to my next trip on Sounds Air! Do you want to go shares in a Saab?? ?